The Trash is a universal problem, faced by all sectors of any society. It is basically everything that is discarded from human activities. Lately, the problem of waste is taking absurd dimensions! It invaded the streets, air, water, and believe me, to our virtual world through the spans and viruses that threaten our computers. Sometimes, we even desire to send it all to space! But the worst is that we already sent it! The orbit of the earth is full of rubble, debris from satellites, ships and other lumber from space! Much has been discussed on the best ways to recycle or dispose the waste generated by the style of contemporary life. Any attempt to reduce the amount of waste or changing its composition requires changes in our social behavior. The demographic concentration in cities and large increase in consumption of soft goods generates an enormous amount of waste of all kinds. Both come from homes and public activities such as industrial processes and technology. Litter is the faithful mirror of a society. The more rich has the higher consumption, generating more rubbish. Their disposal and possible reuse is a challenge still to be won. Oh, and remember to reuse paper that you used to scratch! Cartoon theme: "trash" will be accepted by the organizing committee only cartoons that are related to the topic indicated. a) May compete graphic artists in general, amateur or professional, Brazilian or foreign. b) Each competitor may submit a total of two (2) unpublished works by category. c) The candidate to enroll in this competition, is aware that is solely responsible for the accuracy of data and authorship of the work presented, responding civil and criminal in case is established, during or after the competition, the falsehood of data or works authorship submitted. d) Are excluded from participation in this campaign people directly connected to the event process. a) In this category will compete only students enrolled in basic education schools located in the state of Minas Gerais. b) Each competitor may submit a maximum of two (2) works only for the Cartoon Topic Category: Trash. c) The candidate to enroll in this category, should complete fill the registration form with his and school details. computer to the school that he/she studies. 2nd thematic Cartoon (trash): 01 camera for the winner student. 3rd thematic Cartoon (trash): 01 Mp3 for the winner student. * All students who will be placed between the first 10, will win a special kit with books, designs materials, and other gifts. e) Are excluded from participation in this campaign people directly connected to the event process. a) Forms for registration will be available on the site www.bhhumor.com.br . b) The registration can be done via the event website or via mail. c) It will not be accepted more than one (1) registration form per participant. d) Approval of entries will be disseminated through e-mail confirmation. e) The registration will require acceptance of this Regulation in all its terms and in compliance with the final result of the competition and the allocation and use of drawings. a) The works must be sent in format A3 (297 mm x 420 mm), horizontal or vertical, in JPEG with resolution of 300 DPIs. b) The cartoonists who are involved with 2 (two) works must send them attached to a single time in each of the categories. c) The organization is not responsible for any entry not received due technical components, congestion, failures of communication lines and any other factor preventing the success of transmission via the event website. a) The works must be submitted in A3 format (29.7 cm x 42.0 cm), horizontal or vertical. c) The work should be sent, without any frame in appropriate packaging. The organization of the event is not responsible for damage caused in the transmission of works. d) The organization is not responsible for entries not received due to lost of correspondence, Postal misscarriage, and any other factor preventing the success of sending via mail. a) All the works listed and sent for selection will belong to the organizing committee of the BH Humor, which put on a nonexclusive and exclusive, the property for use as all or part of their interest, which would not, in any case, compensation of any kind to authors. b) After selection, the selected works will be exhibited in the House Casa do Baile and published in site www.bhhumor.com.br and may have, still, together with other works, other destinations.c) It will not be responsibility of the organizing committee the damage caused by third parties, at the exposure to the public or damage caused by the handling of the work during the event. a) The works will be received until 01 September 2009.
b) The trial of the work occurs between days 02 and 05 September 2009.
c) Exposure happens between days 10 September to 18 October 2009.
a) For selection and work awards it will be followed the criteria of creativity, originality and relevance to the theme, the judging committee’s responsible for evaluating, whose decisions must be accepted by the participants, without any possibility of dispute. b) The judging committee will select from the works received 00 (one hundred) works for exhibition that will take place in the Casa do Baile, Pampulha. c) From the 100 (one hundred) works selected six (6) will be awarded, 3 (three) of each category, whose decisions would not be appealed. d) Any omission of this Regulation shall be in due course resolved by the trial, through the organization of the referendum BH humor. b) The disclosure of the winners will be held on 10/09/09 with the opening of the exhibition. Winners will be informed by telegram and / or phone / e-mail their prize. c) The award will be delivered until 60 days after its result‘s disclosure. d) On the values of the prizes, all taxes will force until the date of payment. 1- The Contest is organized by Alanya Tourism & Promotion Foundation and it is open to the cartoonists worldwide. 2- The works contributed to this contest may have been published before; however, they should not have received any prize in any type of contest. 3- The technique and quantity of works are free. However, all works must be original. Digital prints will be accepted as long as they have been originally signed by the artist. Photocopies will not be accepted. 4- If there is any script involved, it should either be in English or Turkish. 5- The size should not exceed 30 x 40 cm. 6- Participants should write their names, family names, country, address and telephone number(s) in capital letters on the back of their works and they should enclose a short biography either in English or Turkish. 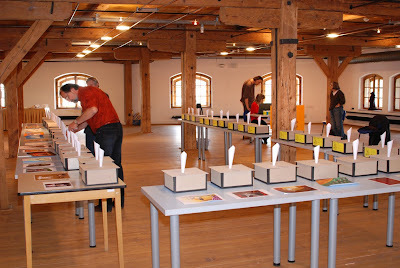 8- The results of the contest will be announced on October 03, 2009. 9- Works sent to the contest will not be sent back to the participants. All works submitted whether they are given a prize or not can be used or published in cultural activities. On the other hand the copyright in commercial usage is belonged to the artist. All of the participants are considered to have accepted these conditions. 10- Some of the cartoons may be exhibited in Alanya along with the prize-winning works for a week after the ceremony. 11- If the contributions are collected and published in an album by Alanya Tourism and Promotion Foundation, the participants will receive a copy. 12- The prize ceremony will be held in Alanya on October 24, 2009. Ercan Akyol (cartoonist), Cihan Demirci (cartoonist), Faik Melih Kaptanoglu (Tourism – Chairman of Alanya Tourism & Promotion Foundation), Mahmut Karatoprak (cartoonist-painterartist), Natasa Kostovska (cartoonist - Macedonia), Kamil Masaracı (cartoonist), Nuvit Ozkan (Tourism), Kamil Deniz Som (Journalist), Ibrahim Tapa (cartoonist). 3rd Prize: 1000 USD + Flyticket for one Person round trip + Holidays in Alanya for 2 Person (All Inclusive). Is that really true? What is the competition between the city and the country? Are cities fundamentally modern metropolises with cosmopolitan trendy inhabitants? Do unsophisticated townsfolk in the country really bustle around in good air and lifestyles out of the 1950s? 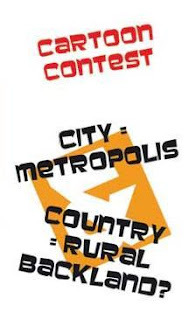 We are looking for cartoons on the theme of city and country, city dwellers and country folk. Personal (in-) sights are welcome. This theme is of special interest this year to the city and county of Aachen, since the two are merging soon into the Stadteregion Aachen. Participation: All cartoonists 18 and over can participate in this international contest. Provide the full name of the artist and if applicable the title of the work on the back of the drawing. The completed entry form, a photo or portrait caricature and a brief CV (max. 280 characters) for the catalogue should be submitted with the drawings. The jury will make selections for the exhibition and the prizes from the pool of submissions. 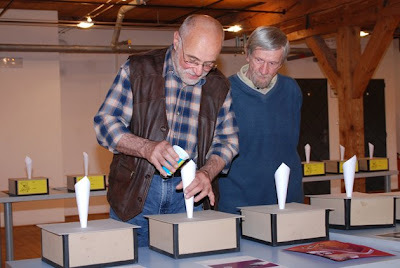 The jury consists of prize winners from past contests, art experts, and representatives of Kuk e.V. and the Aachen Newspaper Publishing Company. August 2009 in Aachen / Monschau. Up to 80 works can be exhibited. The exhibition will be opened with the prize award ceremony tentatively scheduled for 21 August 2009. The KUK e.V. will publish a catalog in collaboration with the Aachen Newspaper Publishing Companthe. Artists included in the catalog will each receive one copy. 4th - 6th Place 500.00 EUR each. All prize-winning work becomes the property of the Kuk e.V. In addition, the organisation has the right to keep one submission from each participant whose work is exhibited. These drawings will be auctioned at the end of the year. The proceeds will be used to support cultural projects in schools within the county. Participants are requested to identify which of the submitted drawings the organisation may keep. Return policy: All work that does not become property of the Kuk e.V. will be returned at the organisation's expense. The returns will be prepared and carried out with the appropriate care. THE 16TH INTERNATIONAL EXHIBITION OF GRAPHIC HUMOR WILL BE DEVOTED TO EDUCATION. Alcalá de Henares, June 3rd, 2009. The General Foundation of the University of Alcalá opens the reception of Works for the 16th International Exhibition of Graphic Humor. This year, the exhibition will be place for reflecting about the second of the Millennium Development Goals: The universal primary education. Currently, there are more than 125 millions of children receive no education, and many more don’t fulfill 5 years of education. One of the UN goals is the universal primary education, working to achieve that by 2015 all the children in the world can have the chance of fulfilling a cycle of primary education. 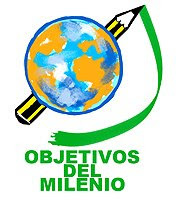 That is the central point of the 16th International Exhibition of Graphic Humor: help the achievement of the second of the Millennium Development Goals through the use of graphic humor as a tool for teaching and for denouncing at the same time. Deadline for delivering the works will be August 28th, 2009. The International Exhibition is open to all the professionals of graphic humor and cartoon that publish or have published their Works in national or international media. The main goal of the exhibition is to sensitize about the importance of education and diffusion in the population (particularly in school students) and the need to advance in the sensitizing of this key aspect for the human development. 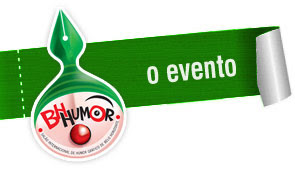 For further information about the conditions of the announcement and other details about this edition of the International Exhibition of Graphic Humor, please check the web: http://www.humor.fgua.es/XVImuestra . This year, the conditions have been published in Spanish, Portuguese, English, Chinese, Russian and German. 1. Participation is open to professional Graphic Humour and Cartoon artists who publish or have published in national or international media. 2. In order to participate in the Exhibition, every artist must send a piece on the theme Universal Education (2nd goal of Millenium). It can be a vignette, a comic strip or a caricature. Together with the piece, the artist will properly fill out and send the form that can be found attached to these conditions (also available in www.humor.fgua.es/XVImuestra). The organisation reserves the right to invite any author/s it considers appropriate. 3. All art pieces must be original, they will be signed and dated, and can be made using any technique and medium. When using a computer to make the piece, the artist will have to prove that that is his/her habitual work technique, he/she must sign the work and show the number of copy and the total number of copies made (e.g. 2/4, if it is copy 2 out of a total of 4). The maximum format will be 297 x 420 mm. (A3 – 11,7 x 16,5 inches). 4. All pieces will be sent properly wrapped (it is recommended to protect them with flat cardboard). The organisation won't take responsibility on any possible damage occurred during transportation. All shipping charges will be at the participant's expense. XVI Muestra Internacional de Humor Gráfico. C/ Imagen, 1-3. 28801 Alcalá de Henares. Madrid. España. 6. 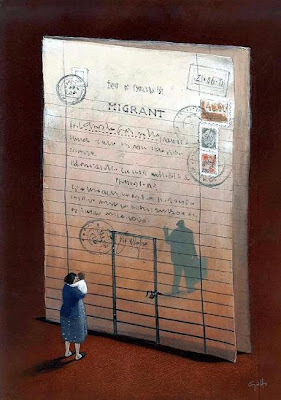 A selection of the pieces submitted (carried out by the Selection Commission) will be exhibited in the XVI International Exhibition of Graphic Humour of the University of Alcalá and in other exhibitions that may be celebrated. 7. All pieces submitted will be kept at the Graphic Humour Archives of the General Foundation of the University of Alcalá (excepting specific indication to the contrary, for which the artist must write on the reverse of the piece “Devolución”), and will be used for its spaces, travelling exhibitions and publications. 8. The submission of the piece means that the author authorises the General Foundation of the University of Alcalá to reproduce it and exhibit it, as long as the name of the artist is displayed and the objective is the media coverage of the Exhibition and the rest of activities of the Foundation within the field of Graphic Humour and/or of this call (edition of catalogues, posters, leaflets, media coverage, web page, etc. ), and in any case it generates any type of obligation on the author's part. 9. The organisation will communicate through the Exhibition web page or through a letter the list of participants with submitted piece and the list of selected pieces. Those people whose piece is selected will be able to attend the opening and all other parallel activities, for which they will be informed of the accommodation and maintenance conditions. 10. At the end of the exhibition in Alcalá, those people with selected pieces will receive a copy of the publication, which will be edited to mark the celebration of the Exhibition. 11. The organisation reserves the right to not exhibit those pieces considered to infringe individual or collective rights. 12. The participation on this Exhibition means the acceptance of these conditions. The Rotary Club of Coffs Harbour City invites you to enter . . . The competition is designed to recognise the best of Australian and International cartoons with prizes totalling over $10,000. The Rotary Cartoon Awards are sponsored by the Rotary Club of Coffs Harbour City to raise funds for various Rotary charities and to promote cartooning through the Bunker Cartoon Gallery. All entries will be donated to the Rotary Club of Coffs Harbour City for exhibitions at the Bunker Cartoon Gallery and other galleries in Australia. They will become part of the Coffs Cartoon Collection. The cartoons may be exhibited and reproduced in a catalogue or similar, onto post cards and copied, at the Rotary Club’s discretion, any time in the future, for sale through the Bunker Cartoon Gallery. The First and Merit winners in all categories also receive a medallion. 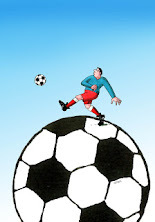 Open to cartoonists worldwide, over 18 years of age. Closing date for entries, 1 August 2009. Special 2009 Theme: GLOBAL FINANCIAL CRISIS 1st: $750 Merit: $250. One cartoon will be selected from all categories (National and International sections). This prize which includes the category prize will be $3000 and a special Winner’s Plaque. The Award Presentation will be held on Saturday 5th September 2009 at The Bunker Cartoon Gallery, Coffs Harbour. The Rotary Cartoon Awards 2009 are conducted in association with the Australia Cartoonists' Association and the Federation of Cartoonists Organisations. CLOSING DATE: 1 August 2009. 1. The Rotary Cartoon Awards are open to anyone over the age of 18. 2. No captions are permitted in this section. 3. Identification of the subject must appear on reverse of the work, written in pencil, in the top left hand corner. 4. All cartoons submitted must be clearly labelled with the artist’s name, address, telephone number and e-mail address written on the reverse of the work, in pencil, beneath the subject’s name, in the top left hand corner. This makes for easy identification of subject and artist and does not mar the work for exhibition. 3. There are no restrictions on the number of entries submitted and entries may have been published or be unpublished. 5. 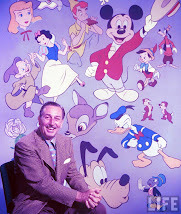 Cartoons must be originals and may be either colour or black and white. Suggested size of cartoon entries is A4 (210 mm x 297 mm) but oversized entries will be accepted. 6. Please do not frame entries. 7. Entry to the awards will be taken as an agreement to accept the rules and entry conditions. 8. 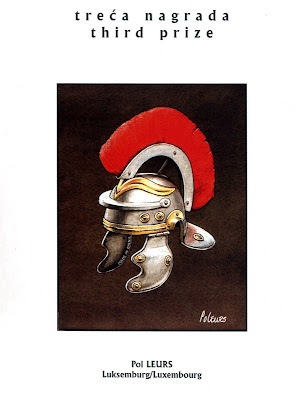 The cartoons may be exhibited and reproduced in a catalogue or similar, onto post cards and copied, at the Rotary Club’s discretion, any time in the future, for sale through the Bunker Cartoon Gallery. 9. The Rotary Club of Coffs Harbour City will appoint judges for the competition. Judges will not be eligible to enter the competition. Judge’s decision will be final and no correspondence will be entered into. 10. Winners of the 2009 competition will be announced on 5th September 2009. The Rotary Club of Coffs Harbour City will notify all winners. Both International Section & National Section Rules & Entry-Forms at the website. 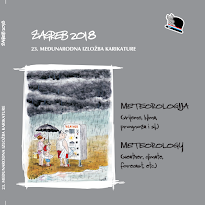 The Bucovina Museum Complex from Suceava invites you to participate to the International Exhibition of Satirical Graphic: “Grippe…”, the 3rd Edition. 1. 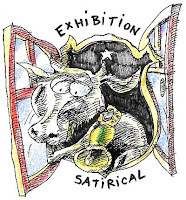 The International Exhibition of Satirical Graphic has as theme: “Grippe…”. 9. If you want to participate at this event, please send your cartoons until 15th of September 2009. 10. The exhibition will be opened for the public in October 2009. 11. The sent cartoons can be bought by the public, that is why please note the price for each original work in order to receive the equivalent of the cartoon. THEMATIC CARICATURE: Agnaldo Timóteo (ACQUISITIVE) singer and Edil from S.Paulo city. All the works inscribed in this category, independently to be selected or not, will be acquisitives for the Cultural Station Association of Caratinga. Number of works: Each competitor will be able to participate with to three works for each category, that has not won at no other gallery or salon. The works must be unpublished and original. It won’t be accepted photocopies or computer reproductions. 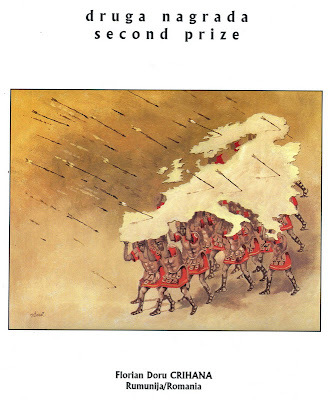 E) A 1st Place prize to “Thematic Category” on the value of R$2,000,00. The prizes in cash will be paid by Caratinga City Hall. (*) All the finalists mentioned above will receive the “Pererê Trophy”, besides the prizes in cash; all of them offered by Caratinga City Council. It will be awarded by the Judging Commission five Certificates of Honorable Indication in all categories. 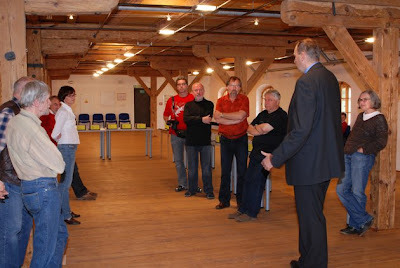 There will be a jury for selection and another one for awardness, made up by specialized people on the area. The awardness jury keeps itself the right of not designating prizes to the categories which don’t achieve a sufficient level, transferring them to other categories or creating a special prize of the Salon. 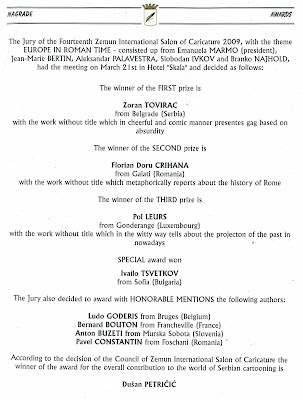 If the awardness jury confirms any kind of irregularity, fraud or plagiarism in one of the inscribed works, it will be able to cancel the award, offering the same one to the following artist from classification list. Awarded works will be spread on the Salon’s site after its opening and they will be contested in the period of one week after salon’s opening with reasonable proves on any irregularity done without jury’s knowledge. Another prizes and indications will be set according to Organizer Commission. or the candidate can paste a copy of inscription available on the site, with all data filled in. The works will be returned until the end of one year after the event on September 30th, 2009; only to the artists that has sent a stamped special envelope joined together with the works. Those which were sent without envelope will be automatically given to the itinerant and permanent heap exhibition of the salon. When inscribing, the author transfers automatically, authorial rights of his works when awarded acquisitivetely, according to the Law Nb. 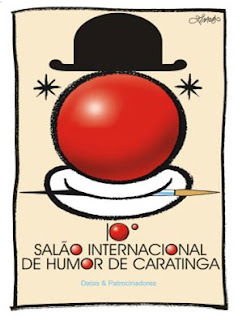 9610, February,1998 (Authorial Rights Law), therefore, universal and definitely in all use modalities and gratuitous, the rights of the author, guaranteed by the mentioned law; referring to the awarded work in the International Humor Salon of Caratinga and now integrant part of National Cultural Heap and Research and Graphic Humor Spread from Caratinga Cultural Association Station; that reserves itself the rights to use them the way it judges better. Simply the inscription implies automatically that you agree with the terms of this regulation. Even from now on, The Energy Issue has priority among the Sustainable Development Objectives of The United Nations, so we have decided to arrange the 6th International Istanbul Cartoon Festival on the this issue. Energy is changing the map of the world; in the near future the most important issue which is underscored will be the energy problem. 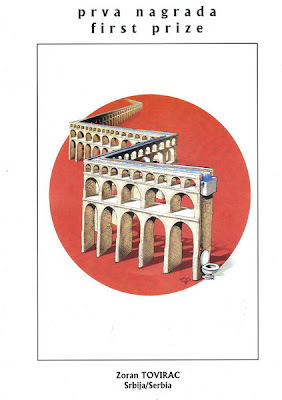 As Yeni Yüksektepe Cultural Association, we will be waiting different explanations from the cartoonists all over the world to be able to draw people’s attention to this increasing energy problem and its possible solutions. The cartoons to be exhibited during the festival in Istanbul will also be exhibited in other branches of our association which are in other cities of Turkey such as Ankara, Izmir, Adana, Antalya, Van, Bursa, Izmit, Mersin, Aydın and associations in abroad which collabarates with Yeni Yüksektepe; for people who are interested in art. We would like to invite you to the 6th International Cartoon Festival which will be held on 10-18 October 2009 with your talented cartoons. 1) EXHIBITIONS: Personal and collective exhibitions of the cartoons under the theme of “Energy” will take place during 10-25 October 2009. More than 200 well-known cartoonists are expected to participate to the exhibition as before. 2) SYMPOSIUM: An opportunity is created for inter-disciplinary works by performing a symposium under the theme of “Energy” with participation of guests on arts, science, philosophy. 3) WORKSHOP: The aim is to highlight the importance of “Energy” once more and also to increase the interest to the art of cartoon among people in the workshops which is participated by cartoonists and people. Detailed information about the place and the daily programme of events will be announced by our website soon. 1) The theme of the exhibition is “Energy”. Cartoons not related with the main theme and the sub-themes, may not take part in the festival and the exhibition. The final decision is to be given by the Organizational Committee, and this committee works with cartoonist Tan Oral’s chairmanship. 2) Technique: Free. Black/white or colour. 3) Dimension: A4 or A3. No passé partout, no frame. 4) By post: If this way is preferred, cartoons shouldn’t have passé partout and frame. Please send them with filled participation form to the below address. 7) No limitation for the number of works to be sent for the exhibition. 8) All cartoons will be kept in the cartoon archives of Yeni Yüksektepe Cultural Association and will not be sent back, unless there is a special request from the artist to send his/her work back. All the usage rights of the cartoons are belong to Yeni Yuksektepe Cultural Association without any commercial purposes. The originals may be printed or exhibited in Turkey or abroad; used for the books, magazines, catalogues, brochures, VCD’s and DVD’s to be printed by Yeni Yuksektepe and its corporative associations in Turkey or abroad; sent to another association in Turkey or abroad for the purpose of exhibiting or printing without commercial purpose by Yeni Yuksektepe. Even if the cartoonist sends the originals or the copies to Yeni Yuksektepe, the cartoonist will be the owner of the publication and financial rights. Cartoons that were exhibited in the festival will be covered under a booklet. A copy of the booklet will be uploaded on the Internet web site http://cartoonistfest.org/upload/main.asp free for download. News covering the festival will also be available on the same web site. The originals may be used in the news coverage about the Festival in the Print and TV Media. 9) The deadline for the cartoons to arrive to the Festival Organizational Committee is 1st September 2009. Yeni Yuksektepe Cultural Association is a non-profit, non-governmental, philosophical-cultural organisation which does not have a religious or political identity. For your questions you can call us (after 18:30 on weekdays, after 13:30 on Saturdays) or send an e-mail. 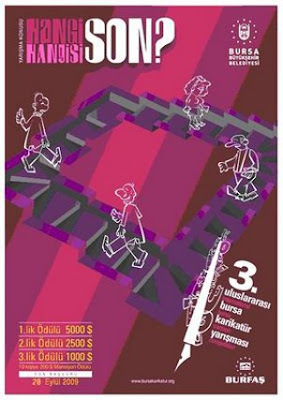 Bursa Metropolitan Municipality is organizing the 3rd International Bursa Cartoon Competition. - Cartoons which will be sent to the competiton could be published before, but should not be awarded at another competition. - The cartoons size should be at least A4 and not more than A3. - Each participant can send up to 5 works for competition. - Participants must write their names, family names, addresses, mobile and home phone numbers, e-mails, and country on the back of the work. - Works will not be returned to the owner. All rights of exhibiting, printing and etc belong to BURFAS. Honorary Mentions: 200$ for 10 people. Certificate of Achievement for finalists. Awards of Success : 500 US Dollars: Mohammad Amin Aghaei (Iran), Angel Boligan Corbo (Cuba), Horacio Cardo (Argentina), Arif Sutristanto (Indonesia), Ilya Katz (Israel), Nikolay Ephremov (Russia), L’ubomir Kotrha (Slovakia), Ross Thomson (England), Alessandro Gatto (Italy), Didie SW (Indonesia). The prize-giving ceremony of the 26th Aydin Dogan International Cartoon Competition 2009 will be held in Istanbul, Turkey in October 2009. With the support of Brussels Comics 2009, Binfikir (a monthly newspaper in Turkish language, published in Belgium) organized the conference “Comic Strip in Turkey”. The conference will be held on June 5th, 14:00, at Istanbul Center in Brussels. The address is: Istanbul Center, Avenue des Arts 46 – 1000, Brussels. Subject: From Tarkan to Zombistan. Comic Strips in Turkey: A Look at the contemporary trends in the light of an eclectic history. Artist Gürcan Gürsel, humor writer Erdinc Utku and writer/editor Murat Mihcioglu will present information on what Turks like to read nowadays, through which phases Turkish comics have come to where they are now, what problems creators face and the influence of European comics on Turkish press. Examples from different eras of Turkish comics history will be presented to the audience. From such highlights as the swashbuckling heroes Tarkan and Karaoglan to the contemporary graphic novels of success such as Zombistan and The Bear Rider, a brief history of authentic comic book production will be put under scrutiny. Gürcan Gürsel, the artist of Turkish origin who is famous for his sports-related BD albums (Les Foots Furieux, Top 15, etc.) will focus on his personal history, which is part of the successful humor magazine of a time, Girgir. Erdinc Utku, the general coordinator of Binfikir newspaper, will moderate the talks, while focusing on cartoons and humor mostly. Murat Mihcioglu, the founder of Rodeo Publications (known best for Rodeo Strip, the authentic comics magazine that was on the newsstands in Turkey until recently) will inform the audience on how Rodeo survived and gave start to the series of brand-new graphic novels such as Zombistan by Cem Ozuduru.